The Hungarian State Opera and Ballet comes to the David H. Koch Theater at Lincoln Center from October 30 through November 11. The four operas performed are Ferenc Erkel’s Bánk Bán (Bánk Banus (The Palatine Bánk)) in its US premiere, Karl Goldmark’s Die Königin von Saba (Sába Királynője (The Queen of Sheba)), infrequently performed here, not heard at the Met since 1906, and, in a double bill, Béla Bartók’s A Kékszakállú herceg vára (Duke Bluebeard’s Castle), coincidently in the Met’s repertory this season, and a new opera by János Vajda, Mario és a varázsló (Mario and the Magician), after Thomas Mann’s novella. The full length ballets featured during the second week are Swan Lake and Don Quixote, and there are other tantalizing events as well, some at other selected venues in the city. Please check out the complete programing when ordering tickets. Erkel changed this. Much like Carl Maria von Weber in Prague, Leipzig, and Berlin, later Richard Wagner, who both sought to establish an authentic German opera, Ferenc Erkel (1810-1893) was a seasoned conductor/composer steeped in the styles of imported opera. He, too, sought to put on stage a work that spoke directly to his people. Though Erkel’s first opera, Bátori Mária, was mostly influenced by foreign sources, with only snatches of Hungarian musical idioms, his powerful Hunyadi László in 1844 brought Hungarian music more to the fore, primarily with the verbunkos,*** a rhythmically strong dance form made popular in the preceding century. Hunyadi László demonstrated that home grown Hungarian opera, replete with local rhythms, was a viable alternative to foreign fare. But at the same time the desire for a Hungarian national identity was gaining strength. In 1848, a staging of Jozsef Katona’s play Bánk Bán further fueled the local passion for freedom from the oppression of the Austrian empire. But the Empire struck back: their retaliation, with the aid of Russia, crushed the temporary republic in 1849. At this time Erkel was already working on his operatic adaptation of Katona’s Bánk Bán, but the premiere was delayed: the political landscape was far too repressive and certainly an opera that featured regicide as part of the plot might incite an insurrection. **** Bánk Bán finally received its world premiere in at the National Theatre in Pest on March 9, 1861, when Austria’s hold on the nation was weakened. Erkel himself conducted. Bánk Bán is generally considered the national opera of Hungary. Why? The plot, of course. Yes, Erkel structured Hunyadi László such that the music for the bad guys was in a more or less standard ‘international’ form, primarily from the French, but though the good guys start out in this form, their sound picture evolves, as the plot thickens, into more Hungarian-based idioms. Bánk Bán follows this pattern as well, but in this case the bad guys on the throne are oppressive foreign royalty from Germany: King Endre II and his Queen Gertrude and her despicable brother Ottó. Bánk, a local, represents the monarchy in the hinterlands and constantly tries to keep the peace. He is a Palatine, which is a position of privilege with the court, but he is not naïve: he warns conspiring locals around the palace to keep down their talk of anarchy. But then the Queen gives her brother Ottó encouragement to seduce Bánk’s wife Melinda, and Bánk becomes unsettled when he hears insinuations and then learns that the conspirators’ secret password is his wife’s name. Doesn’t bode well, does it. To make a long story short, sad but true Ottó seduces Melinda; Bánk learns the truth, utters curses and orders Melinda and their young son out of his sight; Bánk then confronts and assassinates the Queen. Melinda, in her misery, drowns herself and the boy with her, her unhinged musings and farewell are peppered with mad scene coloratura; in the final scene, as the Queen’s coffin is brought before the King, Bánk is arrested for murder and learns of Melinda’s fate. Whereas the Queen’s duet with Bánk in Act II could as well have been composed by Donizetti or a young Verdi, the music leans more toward the Hungarian mode as Bánk gains the upper hand; in Act I the local dance at which the conspirators gather and most of Melinda’s music throughout leans toward or is in the verbunkos form, with instruments associated with Hungarian music: cimbalom, viola d’amour, cor anglais, and harp. Don’t miss Bánk Bán. And now for something completely different: Karl Goldmark weaves a pleasing and interesting musical fabric in Die Königin von Saba, but it’s not set in noticeably Hungarian styles. Verbunkos verboten! Goldmark’s intentions, his influences, and, most important, his source led him, for his first opera, in a different direction from that of Erkel. To make matters worse, Assad is engaged to marry Sulamith, the daughter of the High Priest, so, not surprisingly, Assad is tormented by his sin. The Queen ceremoniously arrives. Assad is shocked to learn the identity of his seducer! But, rank not an issue here, she continues to seek his pleasure in secret; he is seduced again. At the wedding ceremony to Sulamith in the Temple, Assad, like Tannhäuser in the Hall of Song at the Wartburg, breaks decorum, in this case, throws down the ring and exalts the Queen. Shocked, all assembled call for his death, but Sulamith, like Elisabeth, pleads for his life. Moved, the King, grants him clemency by exiling him to the desert. There, the Queen offers to take him back with her to Lebanon, but he resists her with all his might and dies in Sulamith’s forgiving arms. Musically, Die Königin von Saba sports a rich fabric. 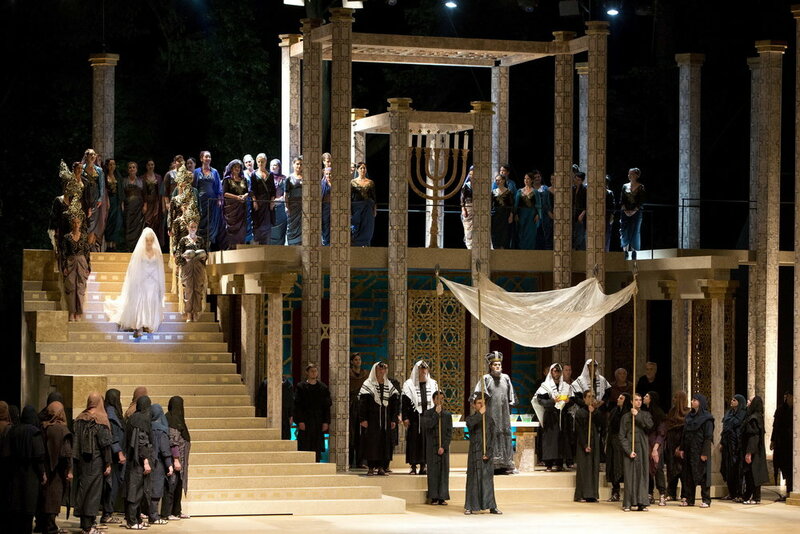 Given the plot similarities with Wagner’s Tannhäuser but also with the seduction scene (Act II) and Temple scenes in Parsifal, one would expect it to be more Wagnerian in style. Yes, the characters have their themes or at least a musical color. The moods of the scenes throughout are spot on. For instance, in the Prelude, the theme in the darker strings becomes associated with Assad’s inner anguish, his deeply troubled conscience. He is weak and he has sinned. The theme surfaces relatively unchanged at those times when his mental strife rears its ugly head, especially when the Queen lures Assad again into her arms, which leads to the central duet in Act II. Goldmark found his models in earlier sources: perhaps Meyerbeer in orchestration, more likely Lohengrin in rhythm and pace, maybe Weber’s Euryanthe. But the orchestral themes don’t morph and interweave themselves into a complex fabric, as one finds in later Wagner. This music simply wasn’t easily available: Tristan und Isolde was not performed widely, the 1876 Bayreuth premiere of the Ring hadn’t happened, and Parsifal hadn’t been written yet. Die Königin von Saba premiered in Vienna on March 10, 1875; it premiered in Budapest a year later. It remained popular in Vienna until the rise of the Nazis. Its Metropolitan Opera premiere was on December 2, 1885, starring the great Lilli Lehmann as the Queen (she was Wagner’s first Brünnhilde at Bayreuth for the Ring’s premiere season); Königin was performed a total of 29 times, though many of these performances were on the Company’s tours. The Met even performed Goldmark’s Merlin around this time. Die Königin von Saba’s fame was propelled (and still is) somewhat by Assad’s lovely aria in Act II, Scene II: Magische Töne (Magical Sound). You’ll know it’s coming when Astaroth, the Queen’s slave, alerts the Queen that Assad is near, discovered walking in the cypress trees in the deep silence of a moonlit night. In a gentle voice Astaroth lures him closer; Assad remarks on the power of this magical sound and time seems to stand still. The aria was recorded by Leo Slezak in 1906, but he, alas, arrived at the Met after Goldmark’s ship had sailed. ****** Don’t miss Die Königin von Saba. Béla Bartók’s A Kékszakállú herceg vára (Duke Bluebeard’s Castle) is arguably one of the great operas of the 20th century, and a special favorite of mine. To the point here, it’s more familiar to local audiences; the new opera by János Vajda, Mario és a varázsló (Mario and the Magician) is not. A chance here to make the former a favorite and the latter a known composition. Both are sung in Hungarian. Photos: Attila Nagy for Bánk Bán; Peter Rakossy for Die Königin von Saba. Bánk Bán, sung in Hungarian, is performed in the David H. Koch Theater on the evenings of Tuesday, October 30 at 7:30 p.m. and on Saturday, November 3 at 8. 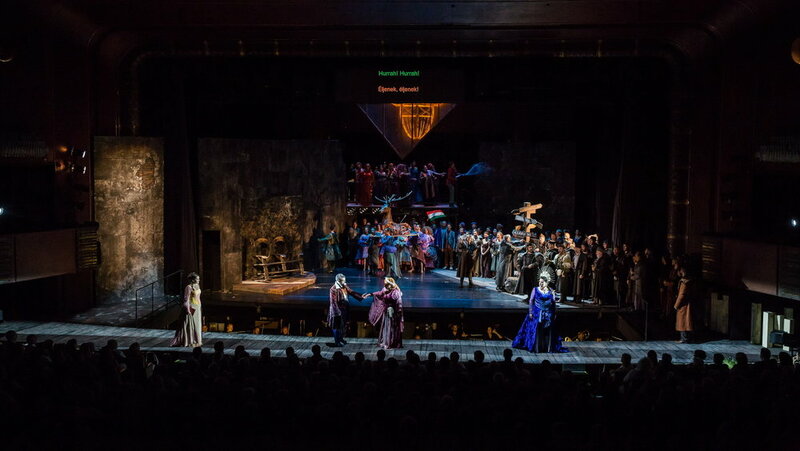 Soprano Zita Szemere sings Melinda, mezzo Judit Németh sings Queen Gertrude, and Levente Molnár is Bánk; Balázs Kocsár conducts. The running time of Erkel’s Bánk Bán, taken from the Hungaroton recording of 1969 is 126.32 minutes; listed time here is 2 hours 20 minutes (with the time of one intermission excluded). Irrelevant but a coincidence: Anna Moffo canceled a Lucia di Lammermoor at the Met in, as I remember, 1968. Karola Ágay, the Melinda on this recording, subbed for Moffo. Beautiful singer, she! Goldmark’s Die Königin von Saba, sung in German, is performed in the David H. Koch Theater on the evenings of Wednesday, October 31 at 7:30 p.m. and Friday, November 2 also at 7:30 p.m. Soprano Erika Gál sings the Queen of Sheba, Boldizsár László sings Assad, and Zoltán Keleman sings King Solomon; János Kovács conducts. The running time for Goldmark’s Die Königin von Saba, estimated from the 1980 Hungaroton recording is about 193.72 minutes; listed time is 2 hours 30 minutes (with the time of one intermission excluded. The double bill of Béla Bartók’s A Kékszakállú herceg vára (Duke Bluebeard’s Castle) and the new opera by János Vajda, Mario és a varázsló (Mario and the Magician) is performed on the evening of Thursday, November 1 at 7:30 p.m and on the afternoon of Saturday, November 3 at 1 p.m. Andras Palerdi sings Bluebeard and Ildiko Komlosi sings Judit; Balázs Kocsár conducts. Running time is 1 hour 40 minutes (with the time of one intermission excluded). *Other operas commonly tagged “national” have themes of the national identity defined by moral superiority, “who’s greater than we are?” (when compared to the outsiders) or by extreme heroism, maybe a sacrifice by a national citizen in the face of foreign oppression (in Russia, Mikhail Glinka’s Zhizn za Tsarya (A Life for the Tsar), 1836, or, more simply, the operas were composed by a great local composer to a libretto in the language of the people, have themes of national color, are performed in a national theater, and since then have come to be the international operatic face of that nation (in Germany, Weber’s Der Freischütz, 1821, in Bohemia, Smetana’s Prodaná nevesta (The Bartered Bride), 1866, or in Poland, Moniuszco’s Halka, 1854. **In the other direction, the operas coming out of Hungary were most likely those of Franz Josef Haydn, who composed for the Esterházy family at the end of the 18th century. Haydn was kappellmeister on their summer estate from 1776 to 1790, composing new operas on command and also managing productions of operas by other composers. ***Scholars trace the main origin of the verbunkos form from music used at military recruiting events, the name coming from the German werben, to recruit, which is not the same as saying that the music itself actually originated in Germany or Austria, though one recalls that what is now Hungary was, off and on, a part of the Austrian Empire for centuries. But the music’s popularity with Gypsy bands increased the strengths of its identification with the Hungarian people, royalty, aristocracy, and everyone else. Though obviously not a bona fide Hungarian opera, Johann Strauss II’s Der Zigeunerbaron (The Gypsy Baron) has a Recruiting Scene as the end Act II, in which Graf Homonay, trying to enlist volunteers for the Austro-Hungarian Empire’s war against Spain, sings the Recruiting Song Her die Hand, es muss ja sein. Verbunkos, pure and simple, also thrilling. Strauss throws in a bold statement of his father's Radetzky March as well. It is fitting that Strauss and his librettist Ignaz Schnitzer consciously intended to realize a drama, albeit a light one, which revolves around the empowerment of the Hungarian people and the repatriation of those exiled under Austrian rule, just at a time when, in the real world, Emperor Franz Joseph needed a little help from his friends. Sándor Barinkay, the Gypsy Baron of the title, comes home from forced exile, reclaims his family’s land, enlists in the army in Act II, then returns to marry formally his gypsy bride. A special opera on my shelf! But then, as long as we’re on Johann Strauss II, probably the most famous Czárdás, a close cousin to the verbunkos form, in opera’s standard repertory is Rosalinde’s Klange der Heimat in Act II of Die Fledermaus. She, disguised as the Hungarian Countess, seeks to verify her identity by wowing the guests at Prince Orlovsky’s masked ball (as well as everyone in the audience...hopefully). But if you do a little deeper digging into the operetta repertory Emmerich Kálmán’s wonderful Die Csárdásfürstin and Gräfin Maritza will entice you; further into that world are Kálmán’s earlier Zigeunerprimas and Lehár’s Zigeunerliebe. No, I’m not forgetting Swan Lake, but that’s not an operetta. **** The troubles Verdi and Donizetti, to name two, had with the censors in Naples are the stuff of legend. Donizetti had to scrap the whole tale of Maria Stuarda, have the libretto rewritten and the opera renamed Buondelmonte and Verdi relocated the plot of Un Ballo in Maschera to Boston because the censors didn’t like the idea of monarchs getting beheaded or assassinated on stage. It might give the locals ideas, if you know what I mean. Indeed, on August 25, 1830 in Brussels at the Théâtre de la Monnie, with King William I of the Netherlands in the audience, a disturbance broke out during a performance of Auber’s La Muette de Portici, an opera about an aborted revolt in Naples. The locals were roused to action, fanned by the duet in Act II between Masaniello and Pietro, in which the verse Amour sacré de la patrie is repeated to a strong rhythm. The disturbance eventually spilled out into the plaza by the end of the performance. The riots led to the independence of Belgium from the Netherlands. *****This is a fate similar to, among operatic others, Samson, Don José, Tannhäuser (by Venus), Vasco de Gama (by Selika in Meyerbeer’s L’Africaine), Énée (by Dido in Berlioz’s Les Troyens), with the near misses for Parsifal (by Kundry) and Jokanaan (by the title character of Strauss’s Salome), though it ends better for the former than for the latter. ******A bit of nostalgia: My first encounter with this aria was through my high school friends George and Peter, twins actually, who, because they were old enough to drive, would go to the grand flea market in Englishtown, NJ, to dig through boxes of 78s looking for recordings of Caruso, Bjoerling, Gigli, etc. They had in the basement an old cranked Victrola with the horn and all. They loved great voices, but George, who was a singer, especially liked tenors. This was before the days of remastering 78s and rereleasing collections on LP, and therefore the only way to hear these performances. Leo Slezak was the tenor for Magische Töne; Nicolai Gedda sings it on an EMI opera arias disc; I lost touch with Peter and George. A lot of addenda here.